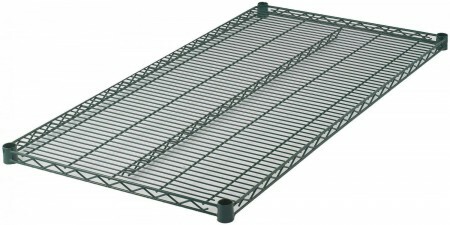 Winco VEX-2424 Epoxy Coated Wire Shelf 24" x 24"
TigerChef > Storage > Restaurant Shelving > Wire Shelving >< Wire Shelves > Winco VEX-2424 Epoxy Coated Wire Shelf 24" x 24"
The Winco VEX-2424 Epoxy Coated Wire Shelf 24" x 24" is an excellent option for storing your commercial or industrial essentials. Designed to provide additional shelf space for your expanding business, this wire shelf is easy to install and requires no tools for assembly. This shelving unit component can be attached to your post through sleeve clips, which are already included in the package. Featuring a heavy-duty wire construction, this shelf is sturdy enough to hold up to 850 lbs. of weight and will endure constant wear and tear. Thanks to its epoxy coated finish, this wire shelf will resist dust and dirt for a quick and hassle-free cleanup that is ideal for fast-paced facilities. Built to endure temperatures from -100°F to 500°F, this versatile shelf can be used to store items in hot, cold, or humid settings. This NSF listed wire shelf is sold in multiples of two with (4) clips provided per shelf.